Has God been leading you to expand His kingdom through the workplace? Not sure how to get started or keep growing? 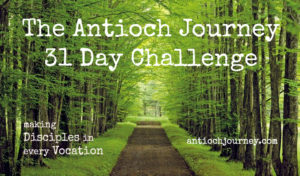 Then sign up for the Antioch Journey 31-Day Challenge below. You’ll receive an email each day, helping you to connect your career and the Great Commission (to make disciples among all nations). The 31-day Challenge covers themes such as calling, transformation, integration of sacred & secular, practical tools and more. We hope you will join us on this journey and bring others along with you. Sign up today! Note: The sign-up process has 2 steps. Completing the form below will prompt a confirmation email from Mail Chimp. If you do not receive that email, check your spam filter. Click the link in the confirmation email to complete the second step of the signup process. Then, enjoy the journey.